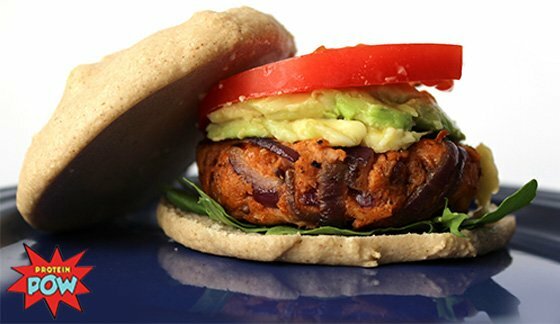 Protein Burger Buns For A Healthier Summer Barbecue! It's no fun eating a burger with a fork, but buns don't always fit in a fitness diet. Try these protein burger buns on for size! They're low-carb, high-protein, and totally delicious. If you're planning a barbecue or picnic this summer, I invite you to rock it with some protein burger buns! You'll impress your friends and family with your mad protein baking skills, and you'll finally get to eat a burger with an actual bun! Even if you're not on a low-carb diet, these buns are a delicious way to add a little extra nutrition to your summer meals. If you're a vegetarian, you can stuff a bun full of vegetables and still get a good dose of protein. Overall, this recipe is a win. Celebrate summer the way it should be celebrated: with family, food, friends, and a protein pow! Substitute pea protein powder with unflavored rice protein powder if you wish. If you don't have either type of protein, experiment with adding some ground almonds. Just make sure your batter is thick before you bake it. For really moist buns, add a tablespoon or two of cottage cheese to the batter before baking. You can also try adding herbs such as dried basil, rosemary, or dried parsley to the batter for gourmet flavor. Chopped sundried tomatoes and olives also work well.